Get Jonah Off Your Ship! The story of Jonah in the Bible is an interesting story. 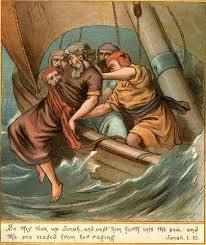 The sailors that Jonah was sailing with found themselves in a storm only because Jonah was on board! They were caught up in the middle of a bad situation that they really had nothing to do with! The Bible indicates that the only reason they were going through the storm was because Jonah was on board! Could it be that some of the turmoil in our lives might be caused by the Jonah’s we’ve allowed to be on board our ships (Friendships, relationships, and fellowships)? Now, this is by no means an attempt to legitimize blaming other people for the situations in our lives. But it is merely to point out the fact that many of those situations exist only because of the presence of certain people in our lives. We can’t legitimately blame other people for the situations in our lives because we allow their presence in our lives! We are the ones who gave them the boarding pass (permission) to be in our lives! So, if there is turmoil in your life, it might be a good idea to take inventory of the people you have allowed in your life to see if they are Jonah. How can you tell if they are Jonah? Let’s go back to the biblical story and see if there are some hints. Note the biblical text reveals that the ship was going in the opposite direction from which Jonah was supposed to be going. The Jonah’s in your life are the people who didn’t really intend to go in your direction; but they are just with you for the ride. They make no real contribution and before you allowed them on board, they weren’t even going in your direction! The Jonah’s in your life are the people who don’t quite fit, but they make superficial adjustments just to be on board. Jonah paid the fare and immediately went down into the hull of the ship! The Jonah’s in your life are the silent, non-participating, and non-revealing people in your life. They know something about you; but you really don’t know much about them! They are the ones who are always “taking” from the relationship while never making a meaningful contribution. Jonah went down into the ship and went to sleep! He even slept through the storm! The Jonah’s in your life are the people who sleep through your storms! When you are going through whatever you’re going through, they are mostly detached, uninterested or otherwise unavailable. And then finally, it was Jonah himself who was the cause of the storm! Because Jonah was attempting to flee from the presence of the Lord, he put innocence people at risk because of his presence on their boat! Beware of letting people into your life and then getting caught up in their drama, which really has nothing to do with you! The cemetery is full of people who are filling an early grave because they allowed certain people into their lives and they got caught up in Jonah’s storm! Many jails are populated with people who made the mistake of letting Jonah get on board and then they got caught up in Jonah’s storm! Whoever you allow in your life; remember their baggage comes with them! Be careful that you don’t suffer the collateral damage of getting caught up in their storms! When I was a teenager, whenever I would tell my parents about meeting a new friend, the first thing they would ask me was: “Who are their people?” Knowing their folks was a good indication of their character! Every now and then, I would meet someone and my mother would tell me that I didn’t need to associate or be friends with that person because my mother knew that person was a Jonah! We all would do well to check the passenger lists of our various ships to see if we have a Jonah on board. And if we do, it would be wise to get Jonah off the ship! This entry was posted in Exegetical Studies, Inspirational Thoughts, Teachings and tagged fellowship, friends, relationships. Bookmark the permalink. ← He Lives! But How? Very interesting essay. it may also be that Jonah can be one’s inextricable partner. I fear my wife is a Jonah. and she seems preserved by God. God bless you. I’m studying about Jonah; wrote a novel about him and am trying to improve it. Hope you will give a look at it. Amen! Going to look for those Jonahs! Cut them quick!